Among the most dramatic and visible creations of plate-tectonic forces are the lofty Himalayas, which stretch 2,900 km along the border between India and Tibet. Himalaya is a Sanskrit word meaning "the Abode of Snow". This immense mountain range began to form between 40 and 50 million years ago, when two large landmasses, India and Eurasia, driven by plate movement, collided. At present, the movement of India continues to put enormous pressure on the Asian continent, and Tibet in turn presses on the landmass to the north that is hemming it in. Although Lhasa is home to only perhaps 15% of Tibet's 2.5 million population, about 90% of all industry (some of which operates only seasonally) is located there, making the city the primary focus of pollution control efforts. Air quality in Lhasa is generally Level 1, rising to Level 2 when wind kicks up local dust -- excellent air quality by Chinese standards. Even so, by the end of 2000 local authorities had closed 15 factories, including heavily polluting cement plants, for failure to meet emissions standards. 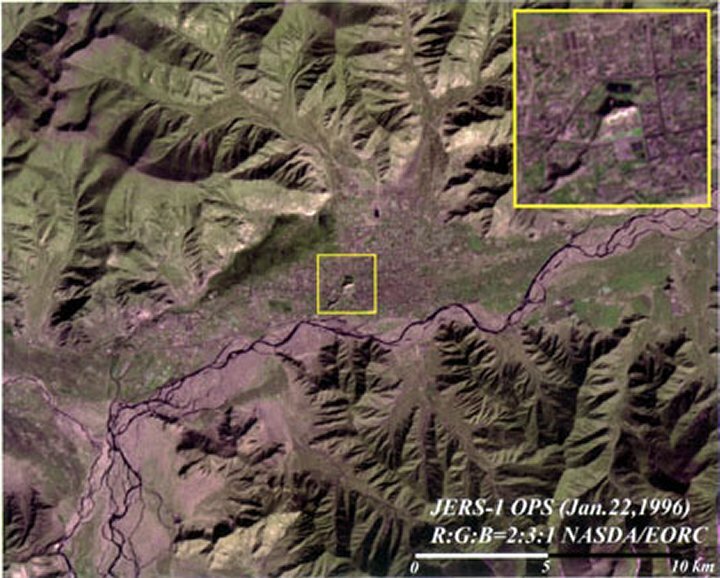 South-central Tibet, surrounding Lhasa, is the region's most heavily-populated prefecture, and the relatively-arid area faces familiar issues of overgrazing and land erosion, in addition to agricultural productivity challenges in the cultivated flatlands. But even here air and water quality is quite good, especially by Chinese standards. Water quality in Lhasa meets national quality standards, although the town still does not have a water treatment plant. Most waste water is from residential sources. The city plans to spend 200 million RMB ($24 million) during the current Five-Year Plan to build a treatment plant that can handle 100,000 tons per day. 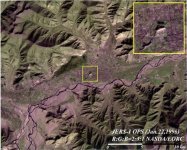 Other, smaller plants will be built in seven relatively large cities scattered around the TAR, including one being built in Qamdo, in northeastern Tibet on the Lancang (Mekong) River. Tibetan nuns Passang Lhamo and Chuye Kunsang are former political prisoners in Lhasa's notorious Drapchi prison. Chuye Kunsang was detained in Drapchi prison from February 1995 to February 1999. She was initially arrested for her participation in a peaceful demonstration in Lhasa against the lack of religious freedom in Tibet. During her detention in Draphci, Chuye suffered numerous beatings and constant abuse and ill treatment. Passang Lhamo was arrested in May 1994 when she was just 19 years old and was released in May of 1999. Like Chuye, Passang was subjected to beatings and many other forms of abuse. Following the May 1998 prison protests and her refusal to sing songs of praise for the Chinese government, Passang was held in solitary confinement and underwent numerous beatings and torture sessions. Following their releases in 1999, Passang and Chuye were denied all political rights and could not rejoin their nunneries. They subsequently fled into freedom in exile and currently reside in Tibetan refugee communities in India. Drawn by economic opportunities in the region, hundreds of thousands of non-Tibetans, many of them Han Chinese, have come in recent years to work on development projects or in related service industries, often in the higher paying jobs. In Lhasa, the so-called floating population of non-Tibetans has been estimated at over 200,000, roughly half the registered permanent population of 400,000. By contrast, until 1951, there were essentially no Han Chinese living in the region at all. These population inflows pose a serious challenge to the preservation of Tibet's special character. As one of four major infrastructure projects launched as part of the 10th Five Year Plan, in 2001 China began building a railway from Qinghai Province to Lhasa in the Tibet Autonomous Region, the first rail link ever to Tibet. The project has received critical attention from China¡¯s environmental community, which worries about the impact of the new railroad on the pristine but fragile high-altitude environment of the Qinghai-Tibetan Plateau. In response, the government has imposed particularly strict environmental protection standards and methods for construction of the railway, and has promised to spend over $100 million on measures to protect the environment both during and after construction. Experts have also expressed concern that the building of the railway will encourage more Han Chinese to move to Tibet, further diluting Tibet¡¯s unique cultural environment. The Qinghai-Tibet Railway is the latest and most obvious representation of Tibet¡¯s fundamental dilemma -- that improving local economic conditions will require more contact with the outside (primarily Han Chinese) world. An obvious, though less explicit, motivation for the large Chinese investment in the Golmud-Lhasa railway is the project's ability to enhance the central government's ability to enforce internal and external security. Currently, relatively few Chinese troops are stationed in the Tibet Autonomous Region, despite the long and (in places) contested border with India. Although China-India relations at present are fairly stable, the new railroad will increase the ability of the Chinese government to move additional troops and equipment into the region if needed. (Although getting them transported around using Tibet's bumpy internal infrastructure is another matter.) Concern about protecting the border with India was sometimes stated as a point in favor of the rejected Dali(Yunnan)-to-Lhasa route, since it would run closer to China's border with the Arunchal Pradesh region of India. In fact, a fundamental dilemma for Tibet is that economic development, very much needed to help in lifting Tibetan residents out of poverty, will almost by definition involve increased contact with the outside- primarily Han Chinese- world. The Qinghai-Tibet Railway is the latest and most obvious representation of that dilemma. 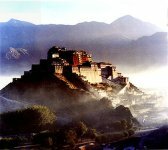 The Potala symbolizes Tibetan Buddhism and its central role in the traditional administration in Tibet. The beauty and originality of its architecture and its harmonious integration in a striking landscape add to its historic and religious interest. The Potala Palace, an administrative, religious and political complex, is built on the Red Mountain in the center of the Lhasa valley, at an altitude of 3700 meters. This 13-story, 1,000-room architectural marvel is the world's highest and largest castle palace. 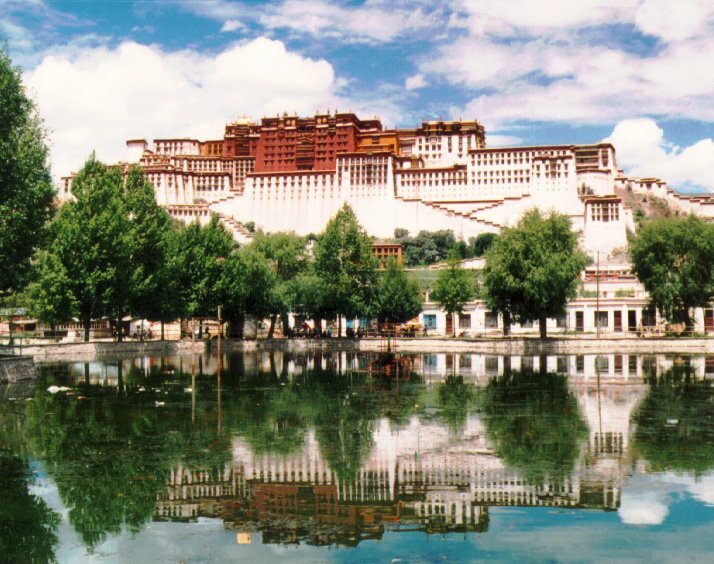 The Potala stands 119 meters high, and its beauty is often compared to the Versailles Palace. 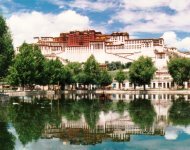 The Potala, winter palace of the Dalai Lama since the 7th century AD, symbolizes Tibetan Buddhism and its central role in the traditional administration in Tibet. The beauty and originality of its architecture, its ornate decoration and its harmonious integration in a striking landscape add to its historic and religious interest. The complex comprises the White Palace and the Red Palace, with their ancillary buildings. The White Palace was the winter residence of the Dalai Lama which also housed the former Tibetan government. The White Palace holds Dalai Lama's living room as well as offices and conference rooms. The Red Palace lodges primarily the tombs of the Dalai Lamas and various kinds of Buddhist shrines. 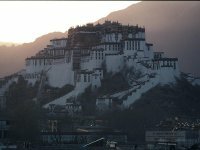 With its numerous murals, paintings, Buddhist statues and scripts, the Potala Palace is also the most comprehensive art and religious treasure house of Tibet. The chambers feature an overwhelming array of intricate murals, 200,000 gilded statues of Buddha, and other treasures of jewels and precious metals. 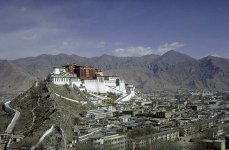 The Potala Palace has its origin in the seventh century when the Tibetan king Songsten Gampo ordered its construction with 999 rooms and a meditation chamber. The building was later destroyed by thunderbolts and war fires. It was not until in 1645 that the Fifth Dalai Lama decided to rebuild the palace in an effort to consolidate his theocracy. 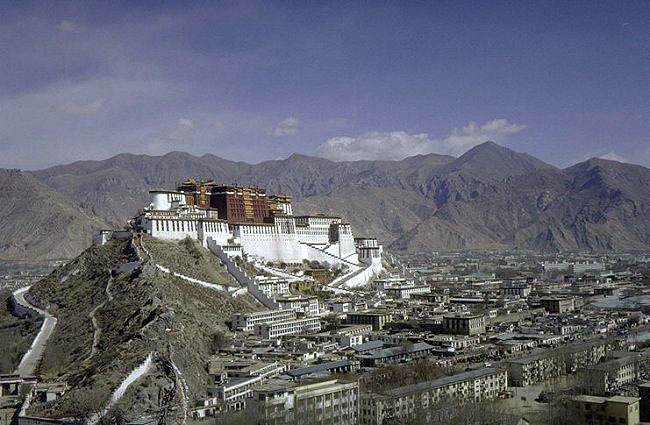 The Potala assumed its present form and scale in 1936 when the Thirteenth Dalai Lama's stupa-tomb was completed. 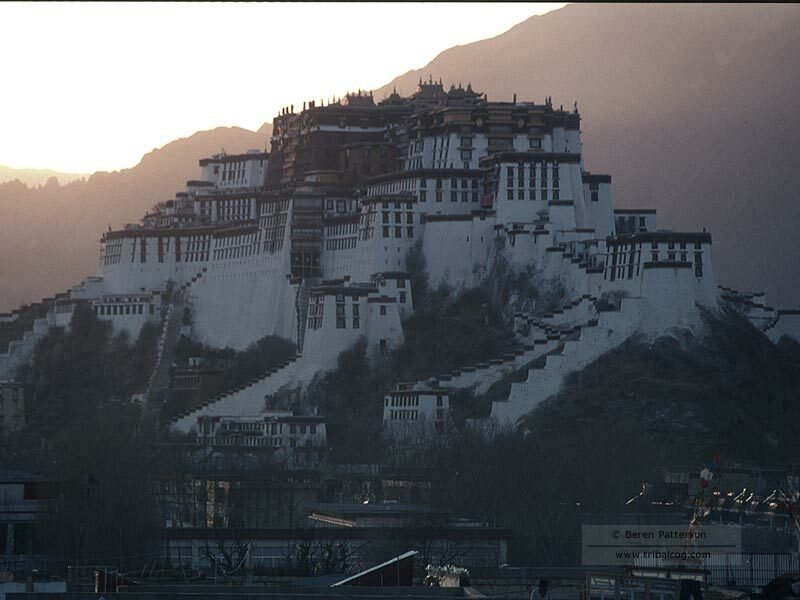 In 1994, the Potala Palace was officially registered as a World Cultural Heritage.